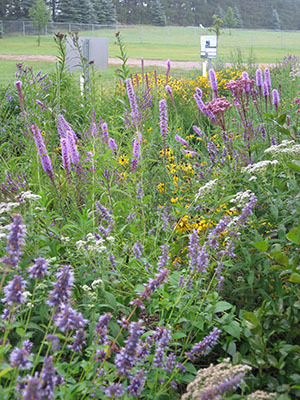 Low Impact Development (LID) is an innovative, ecosystem-based approach to land development and stormwater management. The LID philosophy is modeled after nature: manage rainfall at the source. LID's goal is to mimic a site's natural hydrology by using design techniques that allow water to soak into the ground, filter, store, evaporate, and contain runoff close to its source, resulting in a natural hydrologic landscape and a protected watershed. Techniques are based on the fact that stormwater management should not be seen as stormwater disposal. LID is a versatile approach that can be applied equally well to new development, urban retrofits, and revitalization projects. G reen infrastructure is designed to collect and manage rainwater where it falls, and uses the natural environment like plants and soil. Reduces flood risk by retaining rain and snow melt, slowing it before it gets to local lakes, wetlands, and streams. Green infrastructure has many benefits. It can reduce energy use by lowering air temperatures, lower carbon levels in the atmosphere, provide wildlife habitat and improve air quality. A tree trench, often known as a "vertical rain garden," is a system that consists of piping for water storage, structural soils and a tree. It manages stormwater runoff and promotes the use of trees in urban areas. A tree trench holds water after a rain event, providing irrigation for a tree, and preventing stormwater from entering the stormdrain. Trees can also filter out pollutants including heavy metals. Tree trenches can be found locally at the West End shopping area in St. Louis Park. Urban trees are often replaced far before they can fully benefit the environment. They are often put in spaces that are much too small. Worse yet, they are often unable to benefit from rain water due to poor encasements. Tree trenches solve these problems allowing for trees that can live to maturity. Learn more about building healthy, effective tree trenches in the Minnesota Stormwater Manual from the Minnesota Pollution Control Agency.